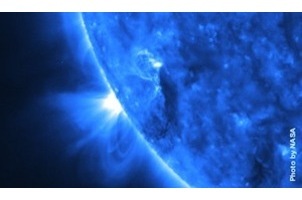 A mathematician discovers a surprising similarity between the cosmic object and an ocean mainstay. Black holes and water vortices both have a coherent boundary, shown in red above, where matter circulates but doesn't escape or fall in. At first glance, a swirling vortex of water seems similar to a black hole: Both take hold of the matter around them, sucking in and trapping whatever drifts too close. Well, it turns out the analogy is more than just skin deep. The oval boundary of water around a vortex in the ocean can be described with the same mathematical equations as the light that whips around the edges of a black hole. Oceanic vortices are stealth forces of nature. They trap water and pollutants, and shuttle warm water northward — influencing the rate of melting sea ice. Even though they’re about 90 miles across, they are still relatively small features in the huge ocean, hard to detect in satellite data. George Haller, an applied mathematician at the Swiss university ETH Zürich, wanted to better understand their movement and characteristics, so he set out to describe the invisible barrier that surrounds a vortex — the “coherent boundary,” in which water circles, but does not fall in or break away. Black holes also have coherent boundaries: If you could shoot a beam of light so it just skims the edge of a black hole, the light’s photons would whiz around it, forming a photon sphere. As Haller explored the coherent boundaries of vortices, he found the mathematics of both phenomena are analogous. “Literally the same type of equation,” he says. Haller and a colleague at the University of Miami put the mathematical “aha” moment to practical use, searching South Atlantic satellite data for the thin boundaries of swirling water behaving in a black hole-like way. Using equations, they successfully found several “black holes of turbulence,” as Haller describes them. Their discovery will help scientists track and study how vortices transport pollutants, and carry warm water to colder areas. For Haller, it’s the deeper understanding of fluid mechanics that’s most important — but there’s also something satisfying in knowing that the strange geometry of deep space can happen right here on Earth.